Blue Ridge Community College student Scott Swann is learning brewing first hand. Students enrolled in Surry County Community College’s enology program learn every aspect of winemaking by doing. It’s the only school in the Southeast with a licensed and bonded winery. Beer increasingly means big business in WNC, and several schools are prepping master brewers. At A-B Tech, a two-year degree in brewing, fermentation, and distilling is in high demand: Last enrollment, its 24 opening slots were filled within two hours. “It’s about 60 percent hands-on,” says Jeff Irvin, director of the program. “We teach the manufacturing process from small to commercial, supplementing with classroom, videos, and field work.” With strong relationships with area brewers and distillers, students have abundant opportunities to plug in during their required 320-hour summer internships. Blue Ridge Community College in Flat Rock has a Craft Beer Academy and Brew School that collaborates with Oskar Blues in Brevard, where students use the brewery as a classroom. “There’s no substitute for hands-on learning in this field,” says Gabe Mixon, head of the program. 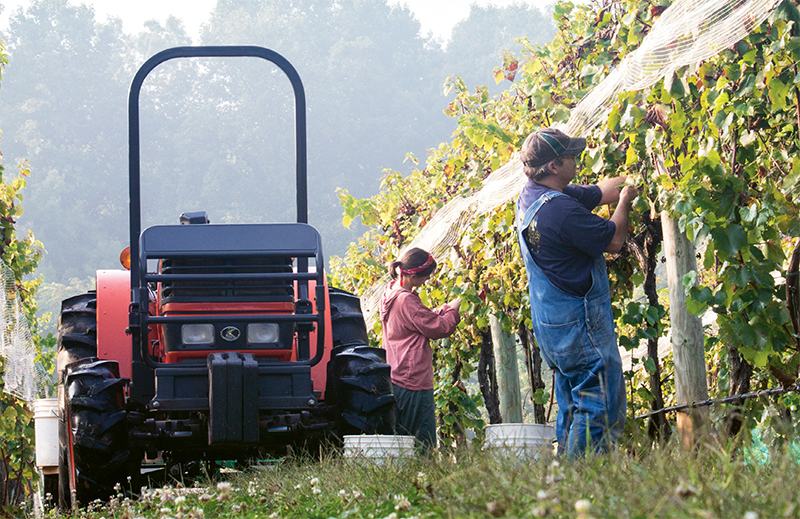 A fermentation sciences program at Appalachian State University offers practical experience through partnerships with vineyards, wineries, breweries, distilleries, and biotechnology businesses. In addition, students have access to state-of-the-art equipment at the university’s Enology Services Laboratory. South College in Asheville offers a certificate in Professional Brewing Science. The first two quarters of the program include classroom work in biology, chemistry, and mathematics, then students gain hands-on experience in a brewing facility. Other spirits are stirring at Surry County Community College in Dobson, the only college in the Southeast with a licensed and bonded winery, which produces three varieties of wine. Enology Instructor David Bowers says the program takes students from the vineyards and bud break to harvesting, crushing, fermenting, and bottling. “We also have a marketing internship that allows us to include the business and marketing of wine,” he adds. Marking a half century this year, A-B Tech’s culinary and hospitality programs imbue students with a deep understanding of both the front and back of the house. “If that swinging door between the kitchen and the front of the house slams shut, everything goes south,” says Cathy Horton, chair of the Hospitality Management Department. “Our hospitality students take basic cooking classes, and our culinary arts students oversee buffets, banquets, and POS systems so they understand the life of a server.” The focus on well-rounded training pays off for graduates, many of whom find jobs not only in restaurants and hotels but across the board in the travel and tourism industry.